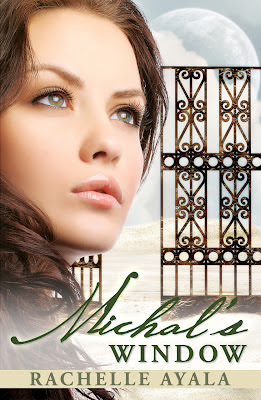 Fridays with Friends - Marketing Maven Lynnette Phillips is Gracing My Blog! I am thrilled to have the very knowledgeable (and very busy)marketing and publicity maven, Lynnette Phillips visiting with me today! 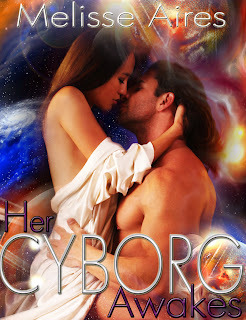 Lynnette, I have been following your work for some time now, and you have a number of helpful hints, aids, and books for writers, particularly indie / self pub authors. It's a pleasure to have this opportunity to talk with you. 2. We have that in common. The more you do, the better you have to be at facing and overcoming disappointment. What picks you up when you are down or discouraged? What moves you? Great fiction (no erotica & seldom romance), fantastic music (most genres) and other people’s smiles! As fiction writers know, a good story is hard to get from your mind to the paper without the tale losing something so I’ve put fiction writing on the back-burner and turned to writing non‑fiction. Lately my works have leaned toward book marketing and promotion with my most recent titles being “QR Codes: Bridging The Marketing Gap”, “Fight Back! 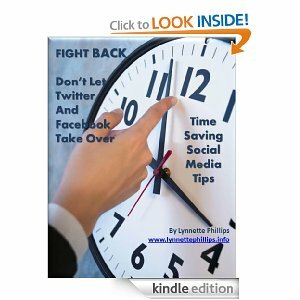 Don’t Let Twitter and Facebook Take Over (Your Life)” and “Offline Book Marketing: Where To Start When You Turn The Computer Off”. 4. What can we look forward to from you in the near future? Upcoming books, projects? This week I’m one of the 20 experts speaking at D’vorah Lansky’s virtual Digital Publishing Summit and I am recording a couple of Internet radio interviews. Plans are being firmed up for an educational teleseminar also. As far as the next book goes, I haven’t cut down the subject options and ideas yet. I have listed quite a few topics but I’ve also been thinking about updating, expanding and maybe combining some of my older publications. 5. Yes, that's something I've gotta get better at - repurposing. You have a prominent online presence. Tell us about some of your projects & programs. What are some of your favorite social media, marketing, publicity, & promo aids? 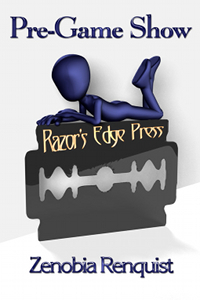 I found my niche when I discovered self-published and Indie authors. There are some real gems waiting to be discovered in the literary world but the biggest thing for most authors is getting their work seen and noticed. That’s where I can help. My favorite programs and techniques change constantly so basically I don’t try to restrain myself by staying with the same ol’ same ol’. Also each book or author requires something unique. For example, Twitter has shown some fantastic results and has some incredible tools and options available but it’s not right for everyone. The most important requirements about social media are versatility, consistency and time-management. · Authors need to be involved and interactive. · Publicity = free (or very affordable) visibility. Exposure, visibility and consistency = book sales. · Marketing and publicity are not one-size-fits-all. · Your only limit is creativity. 6. Most of us can use some help with that. In fact, that's how I started following you - researching publicity and marketing - ways to climb out of that writing bubble without spending all my time online. You are a very busy lady. What time management & organizational tips can you share? Time management and organization is so difficult. My first rule here is flexibility. Stuff happens and it rarely happens when it’s convenient, like a flat tire during rush hour, for instance. For the things that can be scheduled I depend, first of all, on daily and long term ‘To-Do’ and priority lists. These have to be constantly revised. Setting goals and making plans helps. This is where formal schedules and strategies come in handy; think content strategy/calendar for blog posts, 90 day marketing plans/event calendars, you get the picture. Email is a little more difficult – remember, be stubborn – check for things that require an immediate response then close the program. No matter how tempting it gets, don’t go back until you have your priorities taken care of. 7. 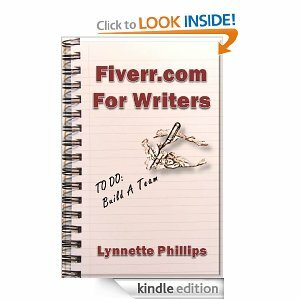 Yes, I downloaded that one and your Fiverr.com for Writers. Very informative. What common threads do your books share? What message (s) do you want readers to come away with? What do you look for in a good book? The common threads are always some form of marketing or promotion. I try to get the message across to authors and writers that 1) writing and getting your book published is only 10-20% of the job, 2) to be a commercial success you have to be involved, interactive and persistent in the marketing phase and 3) marketing and publicity does not have to be work-intensive and can even be enjoyable. A good non-fiction book needs to be informative and teach us something. I also look for a simple and easy to follow format and concise doesn’t hurt either. 8. Words of wisdom for beginning or experienced writers? Don’t throw obstacles up for yourself. Go over, under around or through them but don’t let them stop you. If you find yourself coming up with reasons why you can’t do something – like finish that new novel, reverse your thinking. Ask yourself instead, how CAN I do this and then keep going. 1. Until about a year ago, I had three big house dogs – a broadhead Lab, a Dobie/Coonhound mix, and a Rott mix. 2. My two girls, the Lab and the Rott, both passed from complications of Hip Dysplasia. 3. I don’t cry often, but I still cry sometimes because I couldn’t save them. 4. I believe in the healing power of comfort foods and touch. 5. I’m the sexiest dialysis patient I know (really. Everybody says). 6. I’m a very happy, spiritual person.